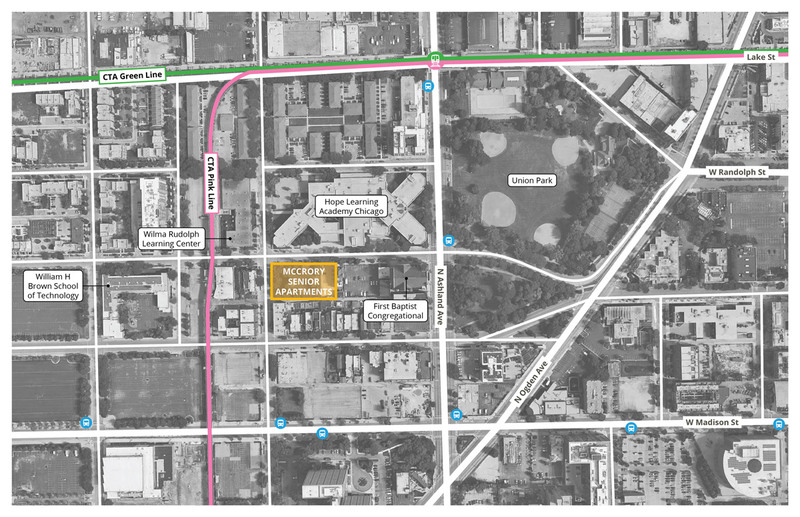 McCrory Senior Apartments is the development of a stretch of ten vacant lots on Chicago’s Near West Side into 62 units of affordable housing for low-income seniors. 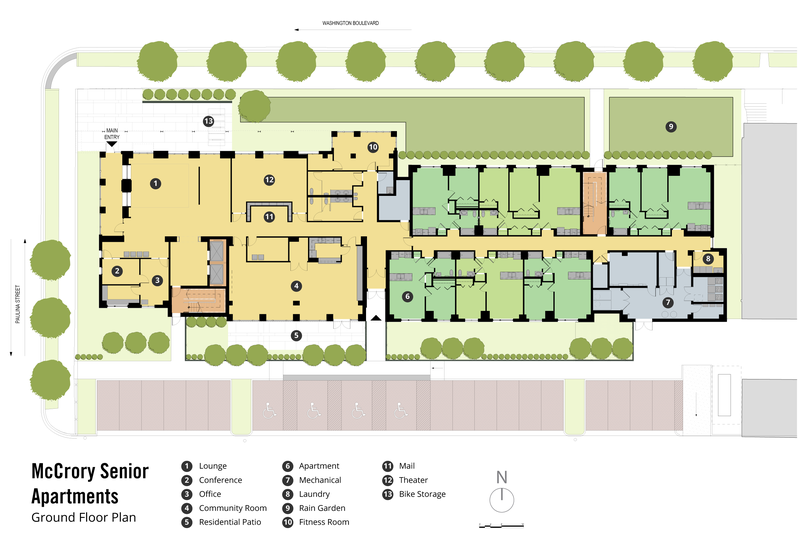 The project is a transit-oriented development located in a highly desirable area, just three blocks from United Center and walkable or easily accessible to restaurants, retail shops, supportive services, and healthcare facilities. As growth from the West Loop ventures farther into the Near West Side, McCrory will preserve affordability for seniors who may be priced out the neighborhood and provides them community-based, independent living for aging-in-place. The building is designed to encourage social engagement, offering places for residents to meet and gather. The building’s exterior will be clad with brick and cast stone, aluminum panel bays, and fiber-cement siding on the rear of the building and will feature “front porch” seating with a focus on a positive pedestrian experience. The apartments will be a mix of 48 one-bedrooms and 14 two-bedrooms with numerous amenities including a community space, fitness room, management office, 24-seat multimedia theater, and rear patio. Additionally, as a partnership of Brinshore Development and neighboring First Baptist Congregational Church, the residents will benefit by the services, programming and social activities offered by FBCC. The team is pursuing Energy Star Certification. McCrory will manage storm water on site with rain gardens and permeable pavers. Other sustainable features include Energy Star appliances and lighting plan; low-VOC wood finishes, paints, sealers, carpet; garbage and recycling chutes for building-wide recycling plan; water-conserving fixtures and faucets; and native, drought-tolerant landscaping.